I met Mike about 12 years ago on my home beach, West Dennis on sunny Cape Cod. He and his then girlfriend were windsurfers visiting from Long Island. Mike and Chrissy were light wind freestyling on a long board. We started a conversation and soon became great friends. Mike and Chrissy and I traveled several years to Cape Hatteras. Both competed in a pro event I co-ran, King of the Cape. Mike was the east coast champion due to his crazy slew of freestyle moves. He has progressed to being one of the US’s top freestylers and later ran his own event on Long Island. 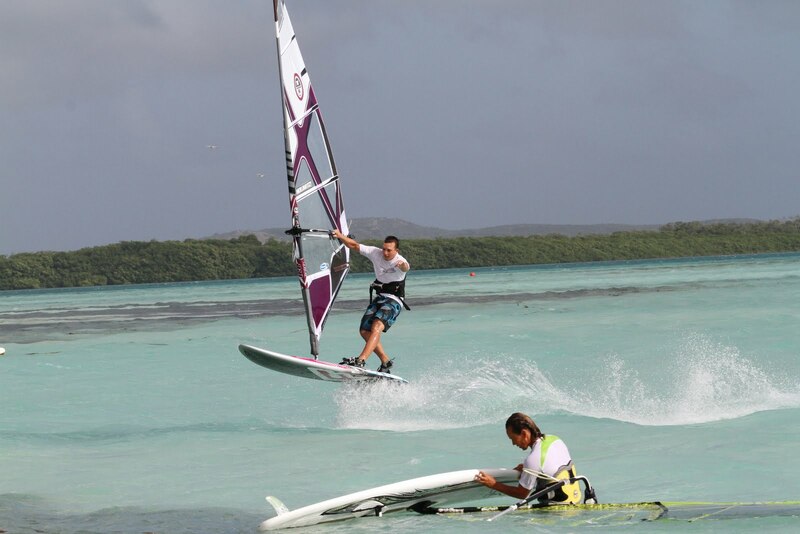 Each year Mike and his Long Island posse head to Bonaire for 2-3 weeks of freestyle and windsurf fun. Mike and Chrissy found Bonaire when I recommended the island for their honeymoon. This entry was posted on March 2, 2011 at 9:48 pm and is filed under Windsurfing. You can follow any responses to this entry through the RSS 2.0 feed. You can leave a response, or trackback from your own site. Hey Ann, taking your advise and making Bonaire our honeymoon destination was one of the best decisions we’ve ever made. We spend all year long looking forward to windy Bonaire.